So many of you have been asking, "when can I read it?" Now, I can give you an answer: September 13, 2011. That's the official on-sale date, when everyone who has pre-ordered will get their copy. However, some of you have been waiting a very, very long time to get your copy. The first pre-orders, from the earliest of early adopters, happened more than six months ago (more than a full year before the on-sale date!). And so I have a bit of good news. 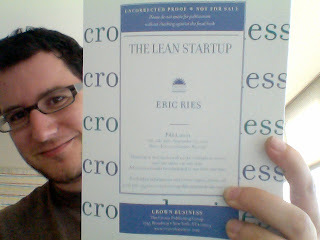 My publisher has given permission for me to give away a few of these extremely early printed copies, which I am going to do in just one week, on May 23, at Startup Lessons Learned 2011. There are a lot of reasons you should come to SLLCONF 2011. Here are just a few: Mitch Kapor, David Binetti (Votizen), Pascal-Louis Perez (Wealthfront), Brad Smith (Intuit), Manuel Rosso (Food On The Table) - and those are just our first few sessions. But now I can add one more reason to come: the first 200 people who show up will get their very own galley of The Lean Startup Book. That's not nearly enough for everybody, so do come early if you want to get one (you'll need a photo ID to register). Registration starts promptly at 8AM, books will be given out first-come-first-served until they're gone. And if you don't get a galley, don't despair: everyone who registers for the conference will get a brand new copy mailed to them on September 13.